Recently we previewed some new housewares, just arrived on the market. Here are three that have found a permanent place in our home. It’s a simple invention but a very useful one: a kitchen towel with a hook attached, the whole thing going straight into the washing machine. The soft, flexible, machine-washable handle is made of a unique rubber. It hangs on just about any drawer or cabinet pull, refrigerator handle or door knob. 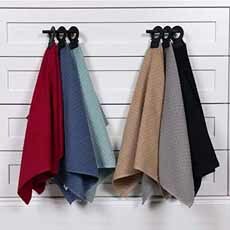 In six colors, the towel blends into every decor. Consider Hook and Hang for laundry rooms, garages and baby’s rooms as well. A set of two 18″ x 28″ towels is $25.99. Now that consumers are aware of the landfill created by plastic straws, some are turning to reusable, washable, eco-friendly straws. Options have been on the market for a few years, but Hot Sips are particularly appealing. They’re soft, bendable and useful for hot or cold drinks. They also prevent teeth-staining drinks, and come in a portable carrying tube. They fit most lids and travel cups. Hot Sips’ oval, patent-pending shape even reduces the effort to sip. They’re made of FDA grade material, are BPA free and dishwasher safe. They’re $8.95 for two 6″ straws (photo #1)and $9.95 for 9.5″ straws. And they’ll last a long, long time. Everyone has a straight vegetable peeler for potatoes, carrots and other root vegetables. Asparagus peeler, to quickly remove the tough woody layer at the bottom. Citrus peeler, to effortlessly peel and zest citrus fruits. 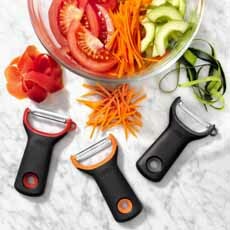 Julienne peeler, to easily peel precise strips of carrots, zucchini and more. Large vegetable peeler, to easily peel large veggies like eggplant or shred cabbage quickly. Serrated peeler, to peel soft fruits and vegetables with ease. Hanging kitchen towels is elevated to an art, with Hook and Hang kitchen towels (photo courtesy John Ritz). 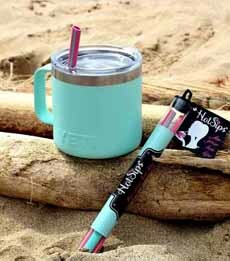 Sip hot drinks with ease, and cool ones without throwing straws into the landfill. Shown: 6″ in cup, 9.5″ in tube. (photo courtesy My Hot Sips). Three of OXO’s prep peelers. The line of six makes food prep easier, even fun (photo courtesy OXO). We particularly love the easy julienne, making tomato roses with the serrated peeler, and peeling and zesting citrus (no more effort peeling grapefruits and oranges!). A set of three is $14.99. We hope these new items are as enjoyable for you as they are for us.